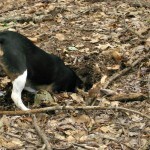 Honey, our beagle, is a true pack hound. She always wants to be with her family and wants to participate in whatever we are doing. This is a feeling that is reciprocated by both Dan and I. When we go for a walk, she goes for a walk. When we lay on the couch and watch TV, she lays on the couch under a blanket and “watches” TV. However, we obviously have to draw the line somewhere, after all, she IS a dog. We’ve drawn this line when it comes to food. When we are making dinner, she is constantly underfoot in hopes that we will drop something she can quickly grab. This rarely happens since we don’t like to feed her human food, but that doesn’t stop her from trying! 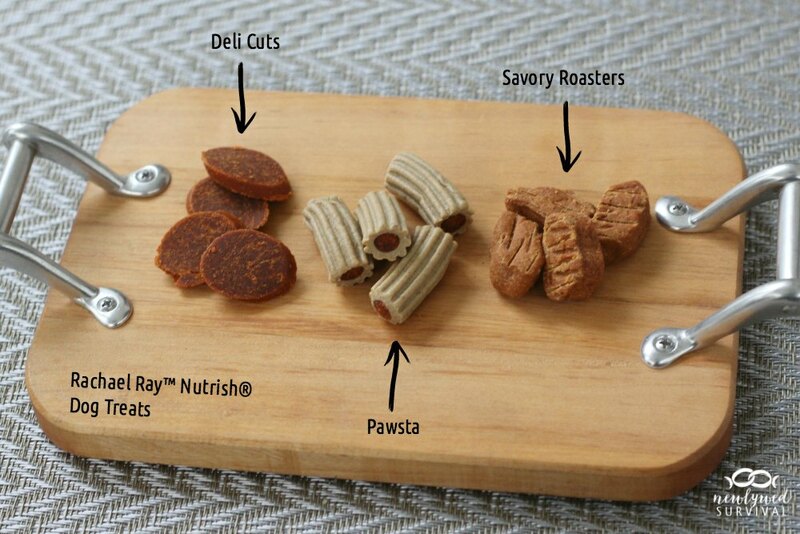 This is why I was excited to find these new Rachael Ray™ Nutrish® Dog Treats. They look a lot like human food, have no corn, wheat, meat by-products or artificial flavors. Plus, the first ingredient is real U.S. farm-raised beef or chicken. I bought mine on Chewy.com, but you can also find them on Amazon or wherever you shop for your groceries. Of course, edible treats aren’t the only way we like to treat Honey. She gets plenty of kisses, belly rubs, and I’ve even made her very own blanket! 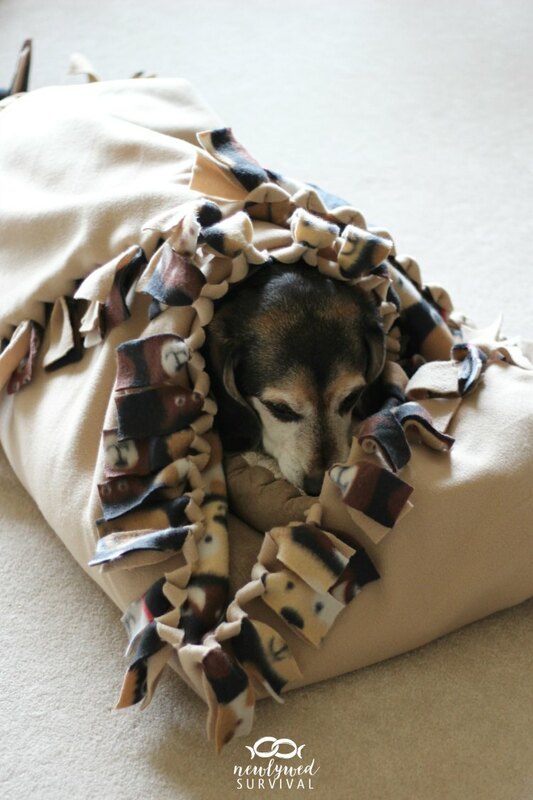 You may have seen a no-sew fleece blanket before or made one of your own. They usually have “fringe” on all sides that have knots in them. 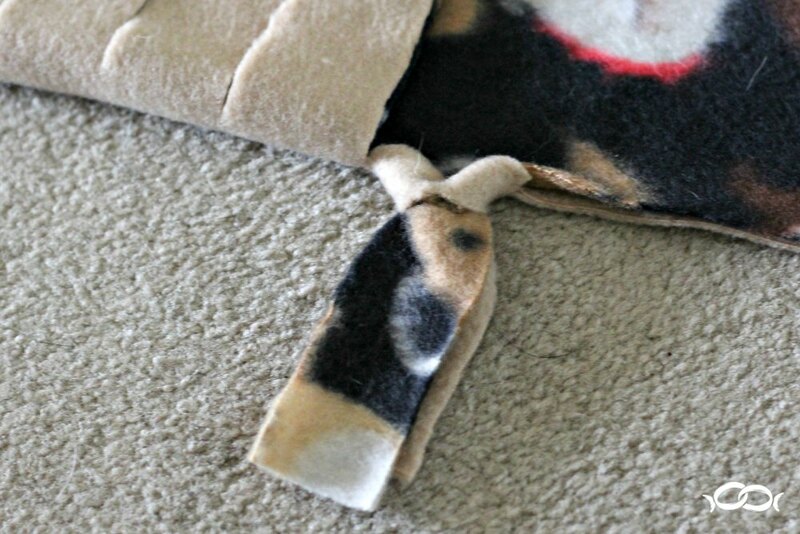 These bulky knots can be a bit annoying if you are laying on them, and I didn’t want Honey to have this issue. 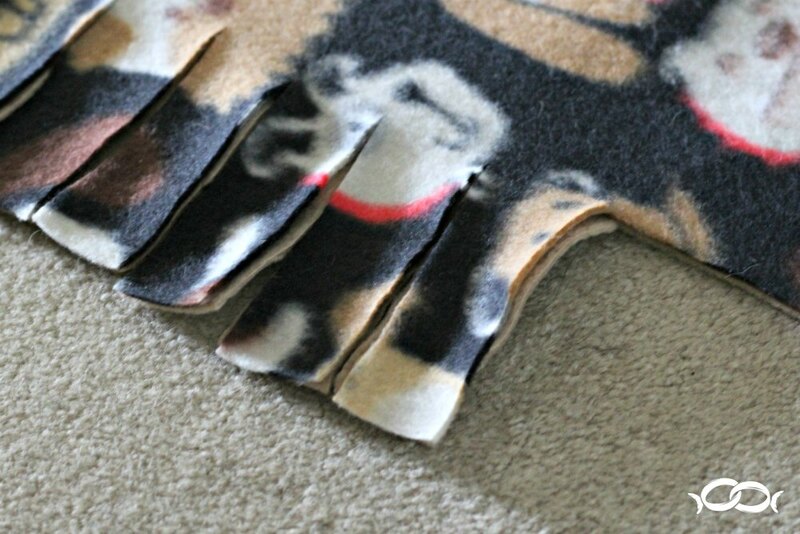 I found an alternative way to make them and the blanket turns out much flatter and doesn’t have the annoying knots! * Use the same size for a toddler blanket. 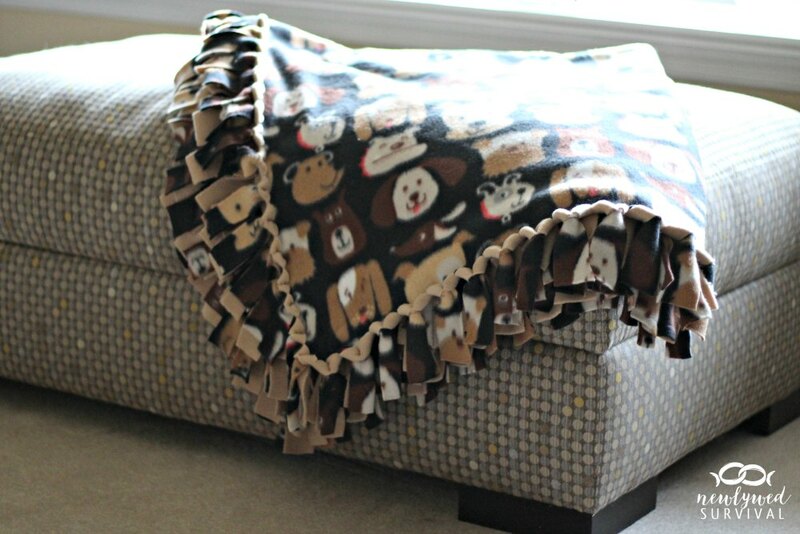 Use 2 yards for an adult blanket and 1 yard for an infant blanket. 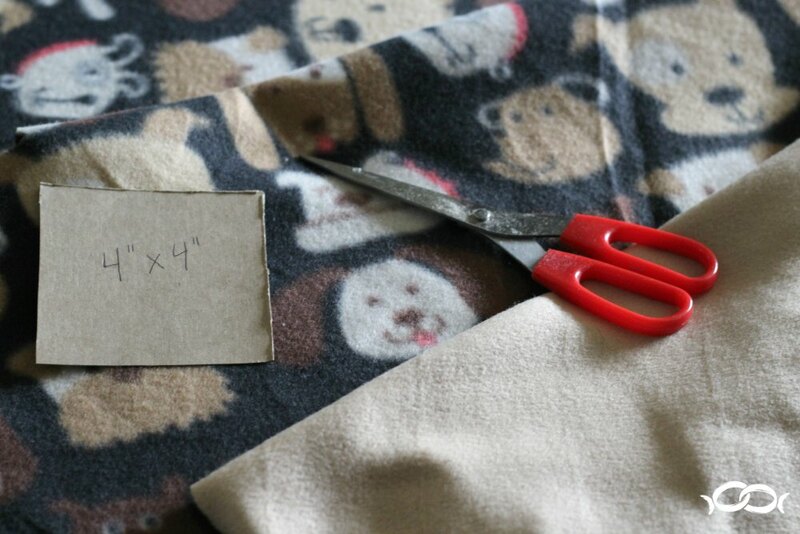 Step 1: Arrange the printed fleece fabric on top of the solid fabric making sure that edges line up with one another. Do not pull too tightly on the fabric or it won’t line up properly on all sides. 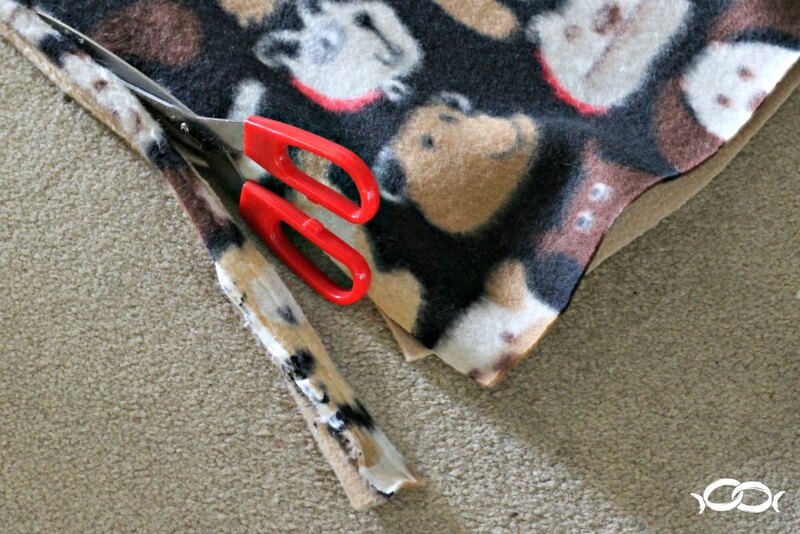 Step 2: Cut both pieces of fleece to 1.5 yards square making sure to trim any rough edges. 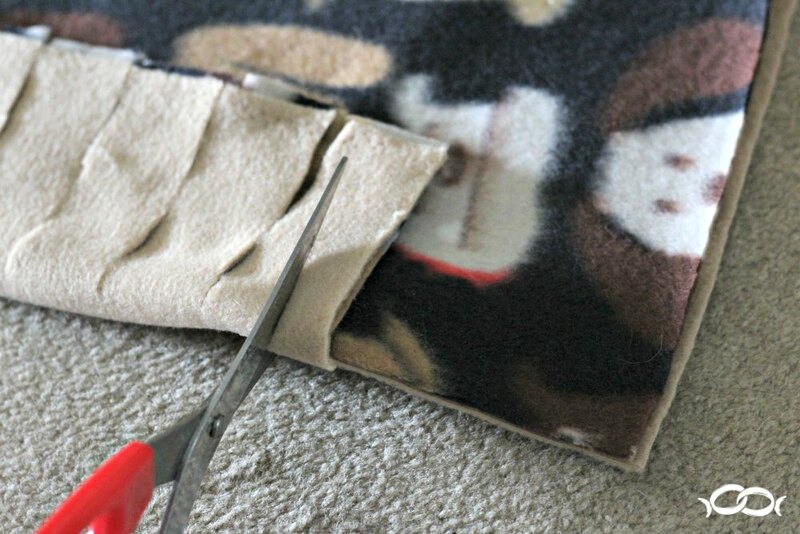 Step 3: Place the 4″x4″ piece of cardboard on one corner and use as a guide to cut both pieces of fleece around it. Repeat for all corners. 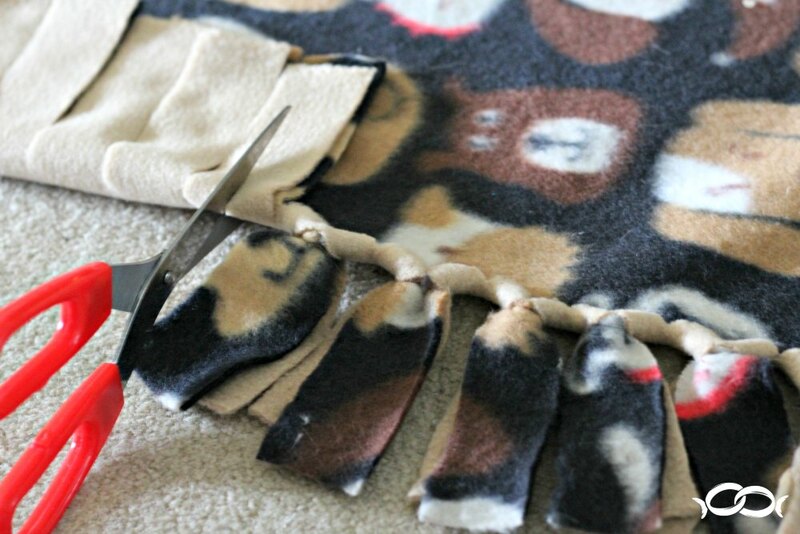 Step 4: Cut 4″ long strips along one side of the fleece. 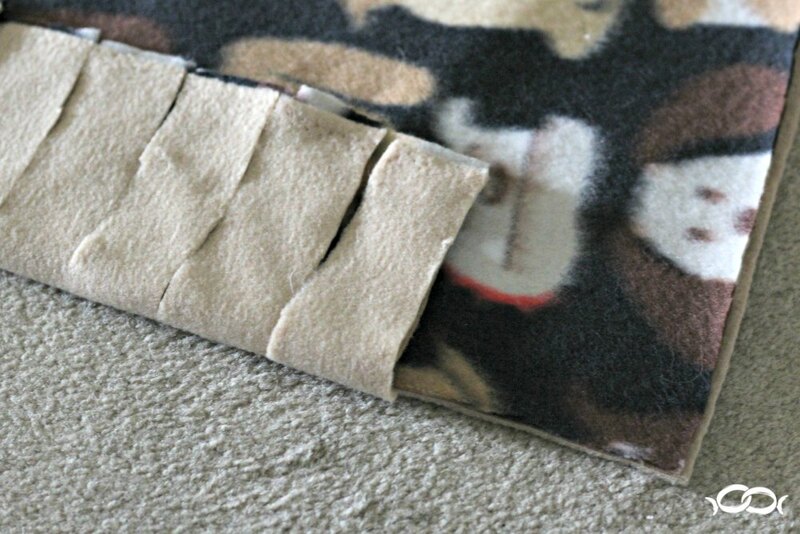 Make each strip around 1.5″ wide. Step 5: Flip the strips up. Step 6: Cut a small slit in each strip making sure to cut through both pieces of fabric. Step 7: Take the ends of the strip and tuck them through the slit you just cut. Step 8: Pull the strips through tightly so they lay flat. Step 9: Repeat steps 5-8 around all four sides of the fleece. Now your dog can enjoy her Rachael Ray™ Nutrish® treats while laying on her new blanket and not have to deal with any bulky knots! 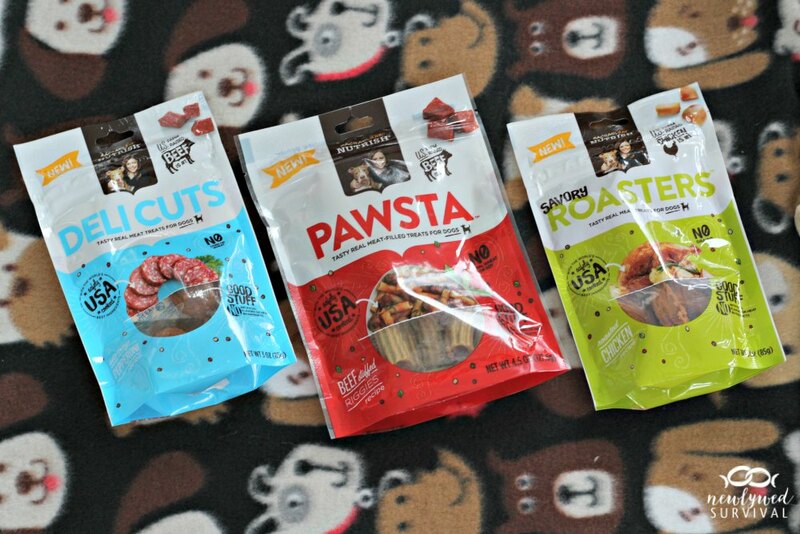 Make sure to check out these new treats at your local grocery store, or on Amazon. 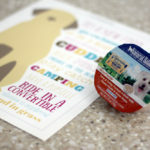 Note: Rachael Ray™ Nutrish® Treats are intended for intermittent or supplemental feeding only. Please watch your dog to ensure Nutrish treats are thoroughly chewed before swallowing. Break into small pieces for smaller dogs. 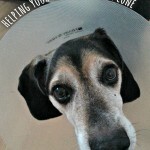 How do you treat your dog? 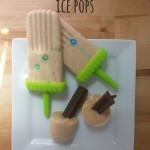 Have you tried these new treats yet? Thank you, Amy! Honey definitely loves hers (she's laying under it right now). So adorable. I'm going to make my daughter one today. Thanks for sharing it with us. Thanks, Nicole! Let me know how it turns out. 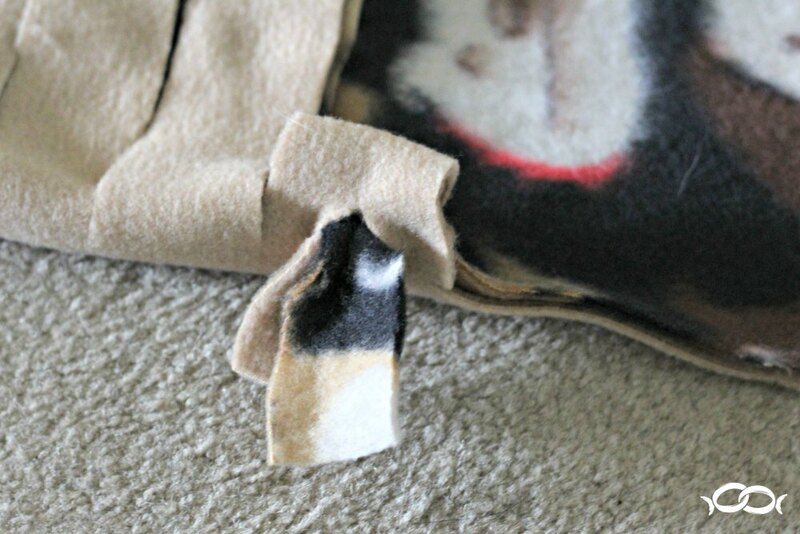 Are you cutting a bit into the blanket as well.....not just the strips when you make the small slit? Yes, Kristi. 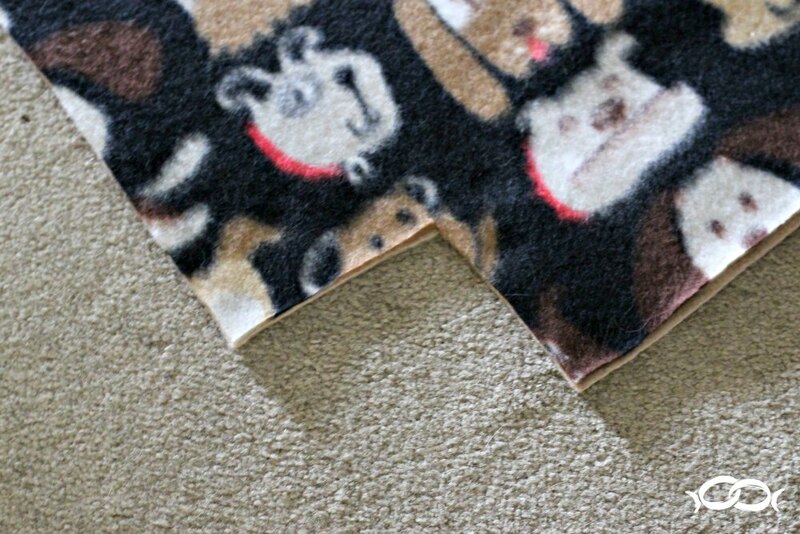 The slit is half on the blanket and half on the strips. Let me know how it goes! I'd love to see the finished product. Are you able to machine wash this? I would like to make this as a gift but don't want it to come apart the first time they wash it. Yes, Lori. I've washed and dried mine multiple times now and none of the knots have come undone! I'd love to see your finished product. If you share it on social media, make sure to tag me. Thanks! My dog is a chewer, can he chew the strips off? Fortunately, Honey is past the chewing stage she went through. 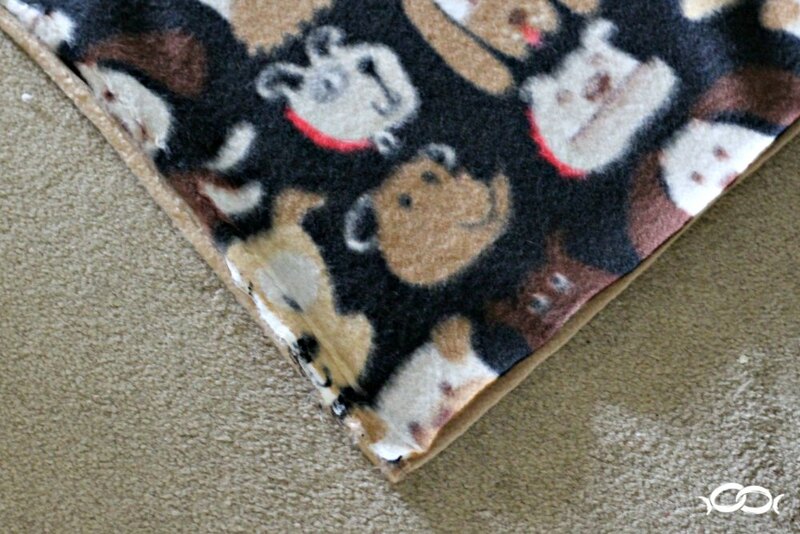 I would think that a chewer can get through fleece pretty easily, so to be safe, I wouldn't leave your dog alone with the blanket or you may come back to a pile of shreds! This is AWESOME! 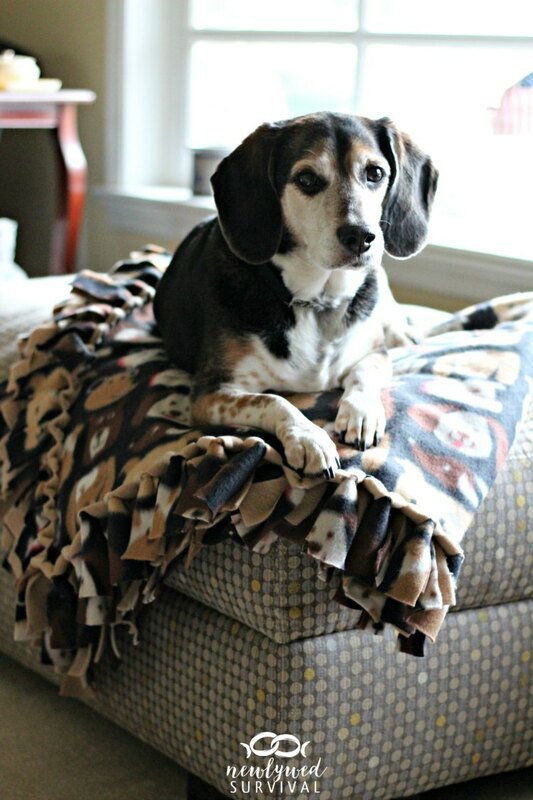 I'd tried my first no-sew fleece blankets this week and I just hated those bulky knots. Can't wait to give your neat technique a try now! Oh My--- I have my children and school kids make blankets for the homeless. We wanted to help the local abuse center by making baby blankets for play pens--I have been struggling with the knot issue. This is the perfect solution--and we are getting geared up--so perfect timing, also. Thank you so much!!!!!!!!! Such a great idea to make baby blankets for a local abuse center. So glad I could help! Why the 4" cut n corners? It doesn't show what to do - i get to that section and am stumped, so I have cut all the way around - can you explain with pics? You cut out the 4" square in each corner so that once you cut the strips and put in the "knots", you are able to just start the next side. If you take a look at the photos under step 5 and step 6, you will see that square essentially disappears. I apologize if I'm not explaining it well. Once you do one side with the strips & knots, you will hopefully see what I mean when you go to do the next side of strips. That is great, Lisa! Definitely a plus! You are so welcome, Jan! I'd love to see the finished product. If you share a photo on social media, make sure to tag me. 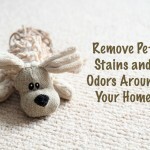 I'm sure your grand puppy is going to love it! I'm glad that the directions were clear for you. I'd love to see the finished blanket. If you decide to share a photo on social media, tag me so I can see it. does it have to be square or can it be more rectangler --2 shorter sides and 2 longer sides? will it work OK? It doesn't have to be square, Patricia. You can make it any size you like. Hope it turns out great! I just made 2 of these blankets today, and they were so easy, and look so nice. Can't wait to send them to my grandkids to enjoy during Christmas!! Thank you Stacey for the easy directions. You are very welcome, Bon! So glad they turned out well for you. So easy and so nice! Comfy! Easy directions! I just tried this way instead of the knots because luke you said no one likes to lay on a hard knot but what im running into is the fabric ripping when I fold thru the hole. Granted I only did 1in strips 3ins deep due to blanket size. Any suggestions? So sorry for the delay in my response, Candy! I hope you got it worked out. I haven't run into this issue before. It sounds like it may be the fleece you are using. Is it pretty thin?